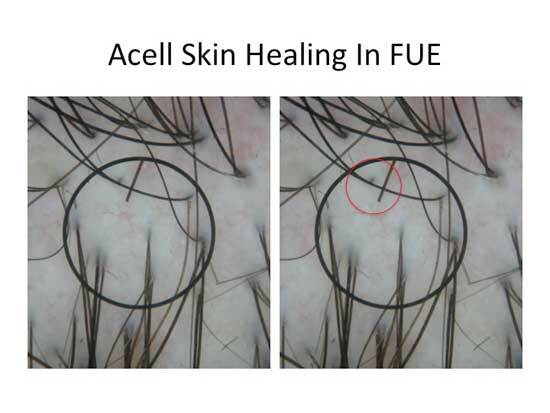 Dr. Cole published a new article about healing with FUE Hair Transplant and Acell, This is very interesting. I find this interesting. This is another FUE extraction site treated with ACEll in a hyaluronic acid mixture after 5 weeks. It is still too early to tell if the hair might regrow in the extraction site though I have seen this. It does appear that a single hair is forming in the extraction site, which appear as a black nub. What is interesting is the appearance of a capillary in the skin. These are usually missing following FUE and help lead to the loss of pigment in the extraction site. I’ve done enough FUE to spot extraction sites anytime I look at a donor area even when no hypopigmentation occurs. It is an observation based on experience with FUE. With this donor area, I could not find any evidence that FUE was performed. The red circle is where I would expect a follicular unit to be. The entire donor area looked like this. The black circle is 10 sq mm. I had the dermlite people make this reticule for me. The long hair after 5 weeks is a result of a completely non-shaven procedure of 1464 grafts. I call this C2G. It is still to early to say for sure because I need more results, but this is an example of what I have seen in donor areas treated fully with ACELL with my method of FUE where I use minimal depth control. The initial problem was treating all the extraction sites with a powder. I overcame this with mixing it in a viscous hyaluronic acid. More recently I have been mixing in a more viscous cellulose. I have a few comparative examples where I am looking at powder, hyaluronic acid, and cellulose. Time will hopefully tell. I think the minimal depth incision technique along with Acell may result in better healing than a full depth incision. Maybe we will see more hair regrowth over time. Maybe not. Still no one could comb through this donor area and find any evidence that a hair transplant had been done. It appears that we really are coming full circle today. Not only have we produced optimal results in the recipient area such that you cannot tell that a hair transplant has been done. Even the trained eye cannot see evidence that a hair transplant was done in the recipient area. » Acell, This is very interesting. It is indeed. Because with further fine tuning, this could easily provide Infinite Donor. I say other docs should also spend their time and keep experimenting with Acell. Hello, has he tried on a case repair? is it just me ? the link takes me to a blank page. » is it just me ? the link takes me to a blank page. The link is working fine. Anyway, I copied the article in the originating post in case you still have trouble accessing the link. » and find any evidence that a hair transplant had been done. » yourself. I find that a little pathetic. Now, if I have ruffled some feathers, I apologize. Before any of you jump off a cliff, I want you to consider this. I know more about this material than any person in this group. You all need to stop criticizing me and start thinking. If you want me to continue being a fly on the wall in this group I will. If you want to kick me out, that’s fine. I would discourage the later however simply because I learn from what you say. Like it or not, I will make your procedure better over time by harvesting your information. Does anybody know if Dr. Cole is incorporating this into all of his procedures or if its still experimental? I remember him saying something about PRP being added to all procedures a while ago. If I were to go t Dr. Cole today for the FIT procedure, would it involve PRP and or ACELL? » procedures or if its still experimental? » PRP and or ACELL? Hell at least he apologizes, which is not very common this days. But its funny even when he apologizes, and therefore supports all the things Hitzig and Cooley said before and also losing his face in one instance, people are harassing him for that? Well guys you should be harassing other docs who even iddnt mention Acell to their patients or try to get some results with Acell. You know i dont give a shi* if Dr Cole is an egomanical as*hole when he can come up with something useful.
" Even if you didnt like some, that someone told you the earth is a ball. You wouldnt say “No its a disc”. Instead you would say " Yes you are right its a ball but you will still be an as*hole"
It doesn’t make sense for him to use Acell on all his patients when the stuff is not even proven, I think he is testing it on a very limited # of patients. I hope this thing works, this would be huge for fue. » » and find any evidence that a hair transplant had been done. » » procedures or if its still experimental? » » PRP and or ACELL? » harassing him for that? » to their patients or try to get some results with Acell. » come up with something useful. » " Even if you didnt like some, that someone told you the earth is a ball. » its a ball but you will still be an ashole"
Except that this is a pattern with Dr. Cole. He did the same thing to Dr. Woods. » Except that this is a pattern with Dr. Cole. » He did the same thing to Dr. Woods. What do you mean? The last bold/red paragraph below? » on the wall in this group I will. If you want to kick me out, that’s fine. » by harvesting your information. … but not just Dr. Cole tried it; Rassman, Bernstein etc did it too (everything is well documented). btw - Is there anybody who would like to know WHY an ACell/traditional FUE/Donor-regrowth never ever CAN’T and never ever WILL work on any consistent basis? Besides many other logical and scientifically explanations, for instance, Dr. Jerry Cooley already explained that issue (incl. photos) at the ISHRS (Oct 2010). Yes i am interested but my idea why traditional FUE and Acell wont give regrow would be, because in a traditional FUE almost everything related to the follicle is “cut” out of the tissue. We are only talking about TRADITIONAL FUE. » the follicle is “cut” out of the tissue. » We are only talking about TRADITIONAL FUE. Is really no one interested besides me? » Is really no one interested besides me? You can be the one who is experimented on and then let us know how it goes. » » Is really no one interested besides me? » You can be the one who is experimented on and then let us know how it goes. » » » Is really no one interested besides me? When will you be having your surgery? Interesting, I haven’t checked the posts here for a while, what’s this “minimal depth incision technique with Acell” all about? Something new that fue doctors are doing nowadays or is this only from Dr. Cole?